Dachshunds Short and Long was Amanda Jones’ third book of portraits, printed in 2005. I have a signed copy. Amanda actually knows my pack, having done two sessions in the past decade. I cherish the photos she’s taken, which adorn the walls of my home. Jones’ latest book, Dog Years: Faithful Friends, Then & Now, captures dogs’ lifespans and their amazing journeys through photos of her clients’ dogs, spanning from puppyhood to late life. My favorite images, in two series, are of Amanda’s own dog Lily, a Dachshund — one at three months, the other at 15 years. I have a special place in my heart for this breed, but more than that, these photos tell of a long, happy journey. Each series of photos in Dog Years includes stories about the dogs and their humans. Some dogs started life in puppy mills, while others were strays that wandered into their human’s lives. More about Amanda Jones at amandajones.com. As a Certified Vet Tech, longtime PR veteran and content marketing expert, Christy Caplan brings her unique understanding of social and digital media to connect dog lovers to brands both on and offline. She lives with three hounds – two Doxies and a Beagle/Basset Hound mix, who constantly teach her about life and companionship.Follow Christy at mylifewithdogspdx.com. Posted in Book Reviews, Feature, Life with Pets, Pet Biz and tagged with Photography. Metro was a lovable, little brown dog that captured Susie Slanina’s heart and is the inspiration behind her collection of children’s chapter books. Slanina, who resides in Vancouver, WA, wrote the books in memory of her Metro and all the wonderful dogs who grace our lives. Both children and adults will enjoy Metro’s fun-filled doggy adventures (both real and imagined) in five beautifully-illustrated books. Metro, The Little Dog books can be ordered from your favorite bookstore or WindtreePress.com. Learn more at Metro The Little Dog on Facebook or MetroTheLittleDog.com. Posted in Book Reviews, Fetch, Life with Pets, Pet Biz and tagged with Book Reviews, Vancouver. Many of us consider our pets “furry children.” Given the opportunity, most of us could fill a book with musings of their characteristics, quirks, mishaps, and hysterical antics. Tracy Ahrens has done just that, sharing moments — from the hilarious to the heart wrenching — of the lives of her first pets: Speckles, a Brittany Spaniel; and her cats C.D., Desdemona, Joan of Arc, and Captain Jack Sparrow. What began as short diary entries to commemorate funny or touching events in her pets’ lives evolved into a collection of newspaper columns, and finally culminated in Raising My Furry Children. Ahrens’s affectionate stories celebrate the bond between animals and humans while accentuating the lessons of patience, trust and respect, as well as the limitless joy they bestow while being our listeners, observers and counselors in life. Steve Dale, host of two nationally syndicated shows (Steve Dale’s Pet World and PetWorldRadio.net) and author of a twice weekly newspaper column contributes a guest story of his dog Chaser, who he says changed his life. An accomplished artist, Ahrens creates beautiful graphite pet portraits, 48 of which are featured. Proceeds from Furry Children support the American Brittany Rescue and American Humane Association. Both tender and funny, Ahrens’s flowing narratives will have you smiling and laughing, fretting and crying, and nodding in agreement as stories hit home for those who share our lives with beloved furry ones of our own. Learn more about Tracy at TracyAhrens.weebly.com. Posted in Book Reviews, Life with Pets and tagged with Book Reviews. December 1, 2013 by Vonnie Harris - Spot Magazine. Our favorite cartoonist, the creator of the Mutts comic strip, Patrick McDonnell brings us a year’s worth of strips — in color from Sunday strips and black and white from weekdays. The creative and socially-conscious vignettes come alive with the unique pop art of this beloved artist. McDonnell’s style is unique and heartwarming, and also powerful in its ability to nail the heart of serious matters such as homeless pets and environmental concerns. 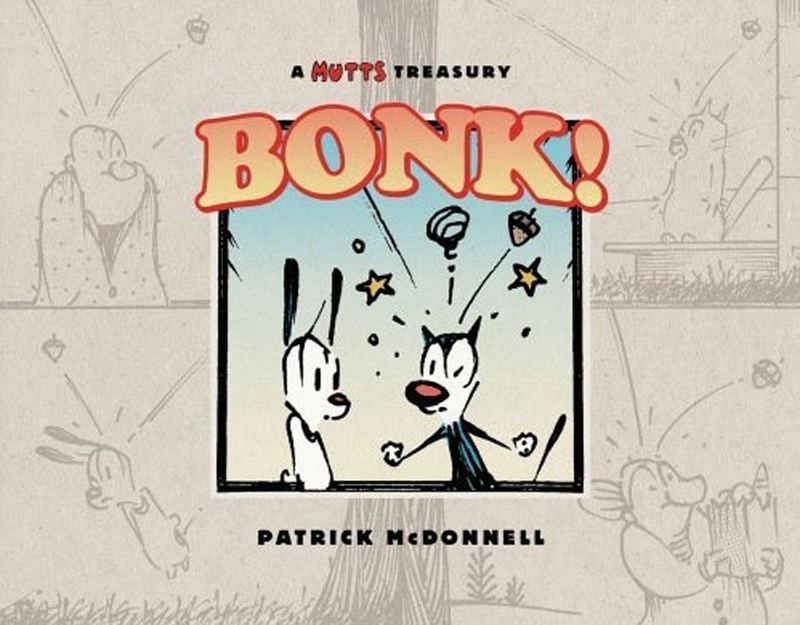 “Bonk” will make a great gift for the friend who loves to laugh and cares about animals, animal advocacy and mother earth. Get better acquainted with McDonnell in the Spot archives — he is featured in the November 2012 issue. Click here to read.